Auction Closed. Sold via Buy Now $800. Next auction Monday, May 15. The old Bobbin Mill still tenaciously grips the river bank here, birthplace of Vermont Castings. 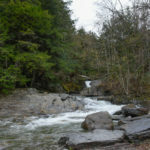 I love the sound of a rushing spring brook as it carries winter’s fading memories away. Yet another great creation Peter! Peter, I especially like this one. I can see the flow of water and even hear it. It brings back memories of camping out with the Boy Scouts in my youth. Nice escape. Thanks. Love this, beautiful, now live in NC, but skied in the area for many years, miss it so! I would love to sit there and have peace! Springtime in Vermont. Nothing better than this. Oh my goodness ! Peter, I absolutely love this painting ! AWSOME ! Reminds me of AT hiking in the ’70’s. Had a friend who owned a summer cabin off Rabbit Hollow Rd out of Northfield right on a stream. Brings back wonderful memories. Thanks! Skied close by at Mad River Glen when we lived in N. J. and stayed at the Montclair Ski Club lodge. Never got to see the Mad River. So beautiful and serene. Did go to 4th of July celebration one year. This is fantastic. The kind of painting that I’d like to sign my name to. I’m going to actively seek out some places like this to paint. Mostly I have access to quiet waters. This is fantastic! The kind of painting I’d love to sign my name to. I am going to actively seek out places like this. I have access to more quiet waters I’m inspired now. Beautiful! So serene! I love to hear water running over the rocks. Love this one!! Is it near North Fayston? Memories of long ago! This one is in Warren, thanks Pam! Like most, I received today’s “Day in Vt” email while in Florida. Immediately felt 20 degrees cooler just looking at it! Gorgeous. Thank you Peter. – From the hot&sweaty south! Thank you Mike, all the best from Vermont! When I was a young child into early teen my parents used to take sundays during the late spring and through the summer and we would travel around the Bermont countryside and fish for our dinners ! I’ve fished this area many times during my earlier years ! I know there were some trout lurking in those pools Bonnie, thanks! Thank you for sharing this beautiful painting. I can almost hear the water flowing. Awsome! 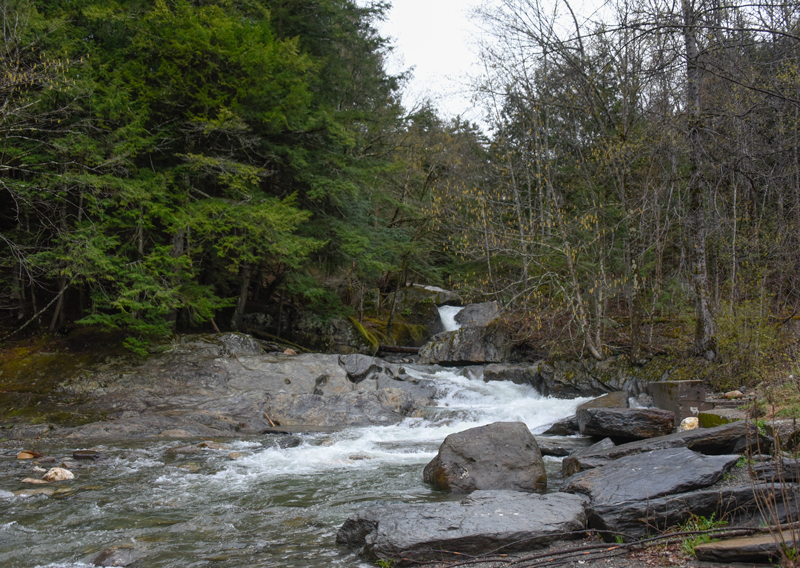 The Gap area is one place in Vermont where you can feel the power of the mountains and the hiking and fishing up that way is really terrific…. Great stuff Peter !!! Take good care my friend, Rick. This sure brings back memories re: first trip over the gap in the spring….woo hoo !!!! What a ride !!! Love, love love this one. We love the Lincoln area. Such natural beauty all around the Gap area. The “torrent” of positive viewer comments says it all! With a few strokes (ok many strokes) of the brush you have captured sound, beauty, memory, sense of place, joy, and on and on! I too absolutely love this one! Such tranquility! My favorite thing to do is is listen to rushing water. It truly relaxes me. Gorgeous picture. Thanks for sharing your talents. I absolutely love this one, Peter. Your canvas is full of near to far action. I’m hopping on those rocks all the way back into the woods! I used to go skiing dipping with friends at the old Bobbin Mill as a kid. The name rolled off our tongues, thought I don’t think I ever connected it to the fact they must have produced bobbins there at one time from the lumber harvested in the area. What memories……. thank you! I enjoy receiving the paintings you share each Monday. 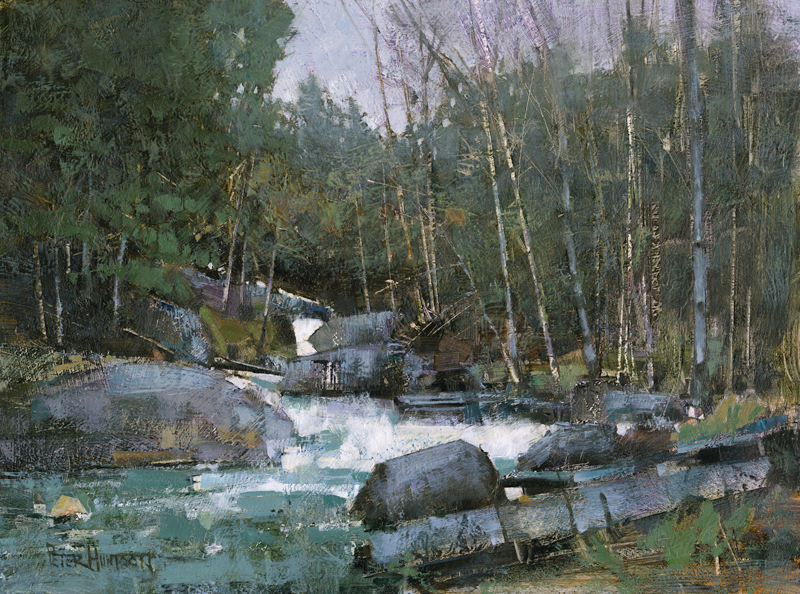 Your painting of the rushing water falls is very refreshing to see, I can almost feel the cold mist cooling my face. The temperature here in Florida 80*. Missing Vt.